Maps Mania: India Google Maps Mashup Roundup! Must See India is a free trip planning and travel sharing application for India. Using the site it is possible to search over 250 tourist destinations in India, plan your trip from start to finish and share pictures and reviews of your trips with other users. Google Maps are used throughout the site to show the location of destinations and to search categories of destinations, such as beaches, religious, art & architecture etc. SVA Search is a car pooling tool for all cosmopolitan cities in India. If you commute to work every day you can use SVA search to find someone heading in the same direction and share the ride. SVA Search enables you to post and search for rides directly from a Google Map. To post or find a ride simply click on the map marker for your city and click the link. SVA Search also has options to buy and sell unwanted items and to find accommodation. 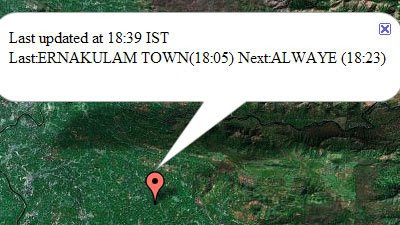 Indian Trains shows the approximate location of trains which are currently running on the Indian railway system. It is possible to show the location of any train by simply entering the train's number and pressing 'go'. If you want to test the map you can find train numbers at erail.in. The location of the train is shown on the map via a red marker. Clicking on the marker reveals the time when the marker was plotted. The location is automatically refreshed every 2 minutes. 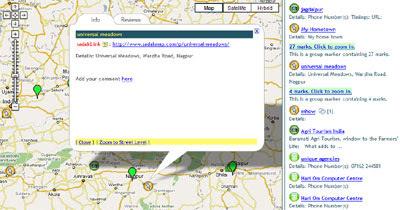 SadakMap is a Google Maps mash-up of local businesses in India. You can browse the map and the local businesses plotted on the map without registering. Registered users however can add places, post reviews and post messages. Registeration is free. Local businesses are shown on the map and are also listed in the map sidebar. If you pan around on the map the local businesses in view on the map are automatically updated in the sidebar. Clicking on the marker of a business opens an information window containing the business details and reviews. Thanks for showcasing my site on Indian railways. I have set up another for showing GPS locations of Bangalore Metropolitan Transport Corporation buses. It shows the live positions of around 350 BMTC buses(out of 5000 odd buses) on google maps. Selection can be done based on route number or bus registration number. A mobile friendly page is also provided.